Well, the snow and cold have officially settled into Northeast Ohio. That leaves me craving one thing...soup. Soup has this magical power to warm you from the inside out, which very few foods can do. I grew up with fantastic homemade soups crafted by my father. He is what I like to call a "kitchen sink cook", where he opens the refrigerator and throws in whatever he can find. Soups, lasagnas, you name it...and while each are unique and some better than others, it always comes out well. So canned soups can rarely "do" it for me, but a great bowl of soup from a good restaurant can really hit the spot during the winter months. 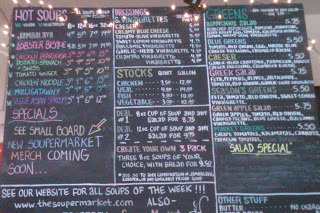 One of my favorite local spots is Souper Market. Every winter, I rediscover their soups. "R" and I were out doing errands the other day, and we stopped in to grab our first soups of the season to take home for lunch. They offer a wide variety of fresh soups, a few "greens" (salads), and hunks of crusty bread to soak up your meal. 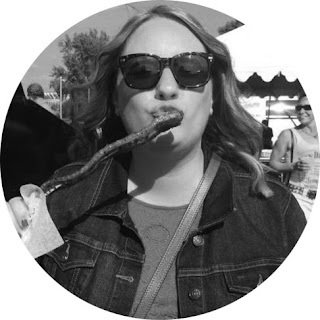 They have three locations: Ohio City, Carnegie Avenue, and Lakewood. I've only been to the Ohio City location- it is a tiny place with just a counter to eat at, so I think most patrons take their soup to go. 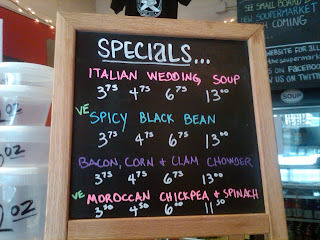 Here is a shot of the chalkboard menu: ...and there are always specials of the week offered. Last visit, I ordered the Lobster Bisque. While not as good as some other lobster bisque that I've had locally, it is a solid option that I always enjoy. If you haven't been before, I suggest checking them out. It is the perfect time of year for soup! The chicken paprikash is amazing! And I love their green apple salad too...the Carnegie location is pretty much the only close place to my office! i love their chicken paprikash so much! I have a soft spot for Italian wedding soup. My mom made a killer version when she was catering back in the day. I haven't had the chance to visit one of their stores yet so this ia nice reminder to stop in. Thanks! Haven't had the paprikash in a while. That may be my next order! I must throw my 2 cents in about the chicken paprikash as well. I would never consider having anything else there, because I love that so much. How I still have not tried Souper Market is beyond me. This needs to change. Yes, get there ClevelandPoet! Great spot to discover.